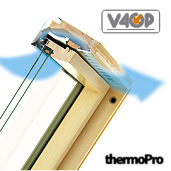 The FEP P2 panoramic window is of top hung and pivot design. There are two opening systems: outward with 40° opening angle, when blockade released changes to 68°; pivot, enables the sash to be rotated through 180°, used e.g. for cleaning the outer pane. 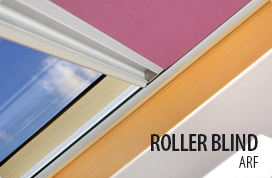 The large sash opening angle allows for an easy approach to the opened window and provides for a wide view to the outside. 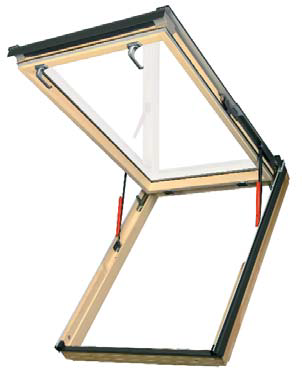 The large window dimensions and ability to lift the sash to an angle of 68° provide an access to the roof for maintenance, repair or escape in case of emergency. Manufactured in pine, vacuum impregnated, coated with two coats of acrylic lacquer. Handles positioned on the lower part of the sash enable the window to be opened slightly, whilst a top catches serve to rotate the sash and to change the method of opening. 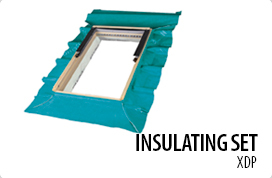 Suitable for roofs with pitches between 15-55°.